Clear 8 mil archival polypropylene page holds four 5" x 7" prints or postcards. Fits in most 3-ring binders. Print File 8 mil archival photo holders provide an ideal acid free storage solution for 5x7 photos or postcards. Holds four 5x7 prints. 25 pack. 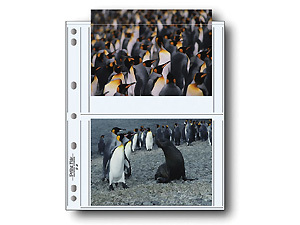 Print File 8 mil archival photo holders provide an ideal acid free storage solution for 5x7 photos or postcards. Holds four 5x7 prints. 100 pack. High clarity 8 mil archival polypropylene page holds four 5x7 prints or postcards. Fits in most 3-ring binders. These Print File Archival Photo Holders provide an ideal acid free storage solution for 5x7 prints or postcards.